**NOTE** You should always avoid sticking your hands inside a garbage disposer, and NEVER try cleaning it out with it running. 3) With the garbage disposal switch turned “off” use a flashlight look inside the garbage disposal and see if there is any debris stuck inside the disposer that is causing it to jam. It is important to note that you should use extreme caution when cleaning out the inside of a garbage disposal. You should always avoid sticking your hands inside a garbage disposer, and NEVER try cleaning it out with it running. If you can, use tools such as pliers and a flat-head screwdriver to clean it out. Carefully check the sides where the inside floor of the garbage disposal meets the inside the walls. If there is something jamming it, this is where the debris will be. Carefully remove any debris. 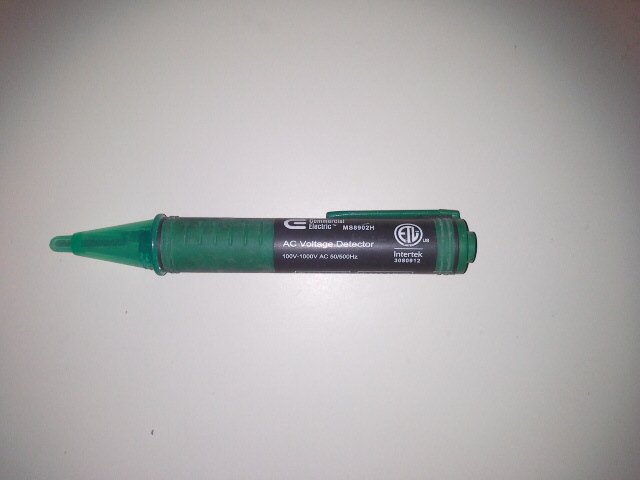 A long flat-head screwdriver is a good tool to use to dislodge any debris that are stuck between the inside wall and the inside floor of the disposer. Once it is clean move on to the next step. Pliers being used to remove derbies from inside of garbage disposal unit. press the red reset button at the bottom of the garbage disposer. If this reset breaker button has flipped it should make a “click” sound when you press it in. 5) With the disposer switch still in the “off” position use the jam-buster wrench that came with the disposer unit and insert it into the hex insert located at the center of the bottom of the disposer. If you do not have this wrench, use a ¼ inch Allen wrench. It’s very important to have the disposer switch turned to “off,” if it is turned on at this point it will cause the wrench to spin causing you injury. 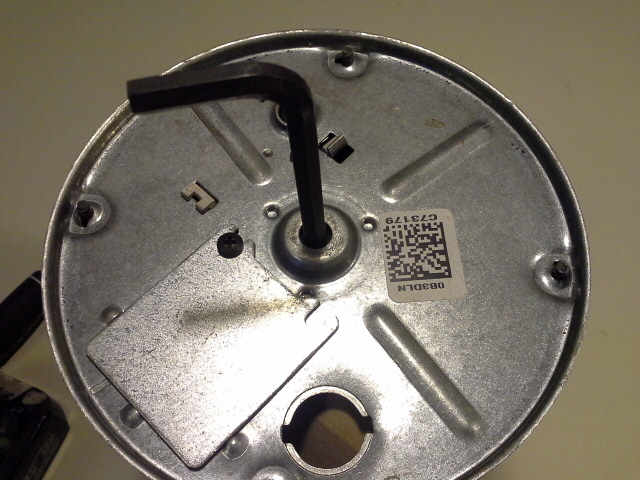 Turn the wrench clockwise and counterclockwise to try and dislodge any debris that may be jamming the disposer. When clear of debris the wrench should easily move when in the hex insert. If there is a jam it may be difficult to move. 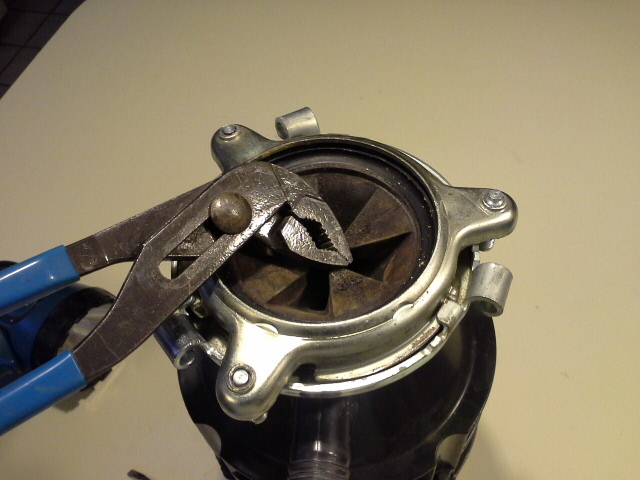 6) With the debris cleared by using the wrench, and the wrench removed from the hex insert at the bottom of the disposer, turn the garbage disposer switch to the “on” position, if it operates smoothy you have repaired your disposer. Carefully check the garbage disposal wall socket (if it has one) with a AC voltage detector. If there is no wall socket, and it is hard wired to the wall carefully test the black wire with your AC voltage detector to see if there is power in it. Remember it will only have electricity when the switch is in the “on” position. If there is no power at the the socket when the switch is in the “on” position, then turn the switch back to the “off” position. You will need to check the breaker in your home’s breaker box to see if it has flipped. 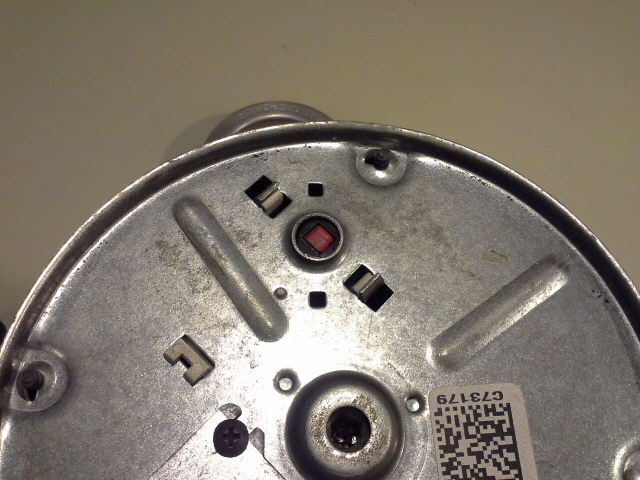 8) If the beaker to the garbage disposal has flipped to the “off” position, flip the breaker back to the “on” position. 9) Turn the garbage disposal switch back to the “on” position. If it does not turn on, or make any humming sound, your disposer is probably burnt out. If this is the case you will need to get a new garbage disposal unit. If it hums, follow steps 2-6. I hope this article has been a help to you. I service north Houston, Spring, Kingwood, Humble and Atascocita areas of Texas, if you would like my services in troubleshooting your garbage disposal, please contact me here.